Fordham University Press, 9780823231249, 136pp. The terrorist attacks of September 11, 2001, did symbolic as well as literal damage. A trace of this cultural shock echoes in the American idiom 9/11: a bare name-date conveying both a trauma (the unspeakable happened then) and a claim on our knowledge. In the first of the two interlinked essays making up The Rhetoric of Terror, Marc Redfield proposes the notion of virtual traumato describe the cultural wound that this name-date both deflects and relays. Virtual trauma describes the shock of an event at once terribly real and utterly mediated. 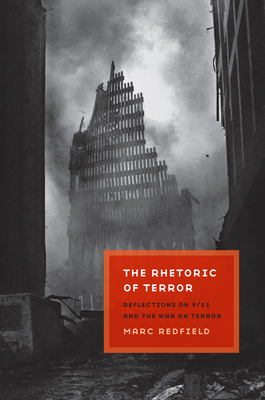 In consequence, a tormented self-reflexivity has tended to characterize representations of 9/11 in texts, discussions, and films, such as World Trade Center and United 93.In the second half of the book, Redfield examines the historical and philosophical infrastructure of the notion of war on terror.Redfield argues that the declaration of war on terror is the exemplary postmodern sovereign speech act: it unleashes war as terror and terror as war, while remaining a crazed, even in a certain sense fictional performative utterance. Only a pseudosovereign-the executive officer of the world's superpower-could have declared this absolute, phantasmatic, yet terribly damaging war. Though politicized terror and absolute war have their roots in the French Revolution and the emergence of the modern nation-state, Redfield suggests that the idea of a war on terror relays the complex, spectral afterlife of sovereignty in an era of biopower, global capital, and telecommunication.A moving, wide-ranging, and rigorous meditation on the cultural tragedy of our era, The Rhetoric of Terror also unfolds as an act of mourning for Jacques Derrida. Derrida's groundbreaking philosophical analysis of iterability-iterability as the exposure to repetition with a difference elsewhere that makes all technics, signification, and psychic life possible-helps us understand why questions of mediation and aesthetics so rapidly become so fraught in our culture; why efforts to repress our essential political, psychic, and ontological vulnerability generate recursive spasms of violence; why ethical living-together involves uninsurable acts of hospitality. The Rhetoric of Terror closes with an affirmation of eirenic cosmopolitanism. MARC REDFIELD is Professor of English and Comparative Literature at Brown University, where he teaches literature and literary theory. He is the author of Phantom Formations: Aesthetic Ideology and the Bildungsroman (winner of the First Book Prize of the MLA) and The Politics of Aesthetics: Nationalism, Gender, Romanticism. Among the books he has edited is Legacies of Paul de Man (Fordham).